Windows can not open your file? Easily find information about file extensions and its associated software that you are looking for. A free application that offers you a quick access to File-Extensions.org database. Windows can not open your file? 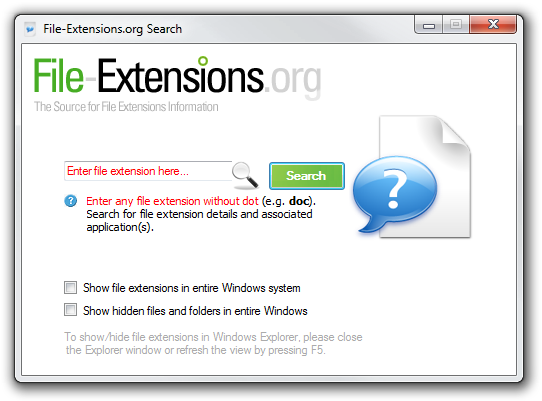 With free File-Extensions.org Search utility you can easily find the information about any file extension that you are looking for including programs associated with it. The application offers you a quick access to File-Extensions.org database and information about file extension and the software it is associated with. You will be able to directly search for extension information from a simple Windows dialog box by double-clicking on any unknown file, or with a new Windows context menu option accessible by right clicking on any file in Windows Explorer. Kernel for Word is efficient MS Word recovery software that performs Word file repair and Word file data recovery from corrupt or inaccessible .doc files.